The world is getting smaller, the number of bilingual families is growing and with this, there is a need and a desire to teach both languages to children. There are a few strategies to raise bilingual children, one of the most popular one is OPOL (One Parent One Language) in which each parent (or carer) speaks to the child exclusively in one language. For example, a bilingual family where dad speaks to the child only in English and mum speaks only in Spanish. Bilingual books can be a good resource for parents, teachers or carers to teach a target language. But, what are bilingual books? As you can imagine, bilingual books are books that have the same story in two different languages. 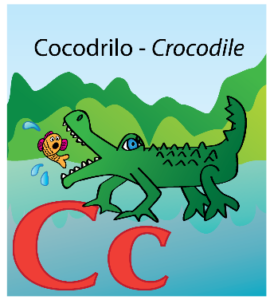 The text is generally split in each language as the objective for children is to read without mixing languages. This way, for example, the carer that always talks to the child in English, will read the story in English, and the carer that talks in Spanish, will read the story in Spanish. Nowadays, there is more demand for bilingual books in different languages, and while I focus on bilingual books for children in English and Spanish, there are bilingual books in many different combinations. In fact, my local library has books in English-Greek, English-Mandarin, English-Italian and many more. This is because those are the books that the international communities in my city are looking for. Now that I told you about bilingual books, I also need to tell you what bilingual books are NOT. Bilingual books are NOT books to learn languages or grammar, Bilingual books are NOT books that mix language and they are NOT books that are translated too literally. 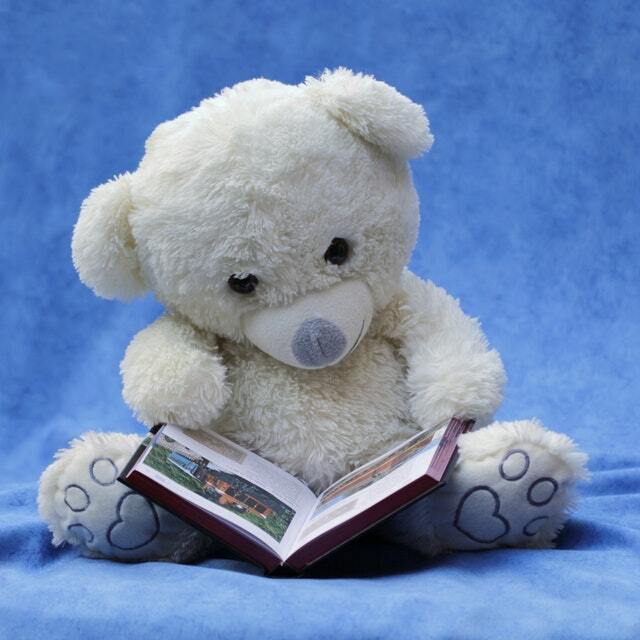 How do I read a bilingual children’s book? It’s very important to be aware that if you are the parent or carer that always speaks in English, your role will be to always read the story in English. On the other hand, if you are the carer that always speaks Spanish, then you will read in Spanish. It’s also useful to point at the illustrations, objects and characters. Ask your child questions about what will happen next. Bilingual books are not a magic pill that will make your child speak another language overnight, however, they are a powerful tool, that combined with daily conversation, music and lots of patience, will help you raise bilingual children. What do you think? I hope I piqued your interest to learn more about bilingual books and that you can find books that can entertain your kids while you give them the gift of speaking another language. Sometimes our kids ask to read the same book again and again, so much so, that we end up learning it by heart. In the case of alphabet books, you don’t only have to read from A to Z in that order. Here I share some tips so your trip through the letters of the alphabet is more fun. Focus on the drawing and the sound of the letter. Ask your child what the illustration is, what is it for, what colour it is. When your child says the word emphasize the sound of that word. 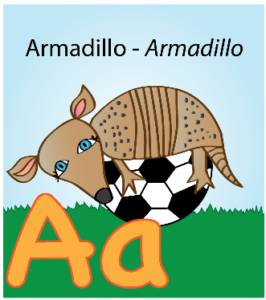 If it is an armadillo you can say “AAAAArmadillo”. If it is a dinosaur you can say “DDDDDinosaur” and so on. The idea is that your child can relate that sound to the letter he is seeing. This works very well with kids older than 3. You can pretend to say the wrong letter or the wrong word for the illustration. If your kid already knows that letter, they will be very happy to tell you the right letter. If they don’t realise you have it wrong, maybe you need to wait a little bit to use this tip. Name different words with the same letter. Don’t limit yourself only to the word in the picture. Ask your kid what other words start with that letter. Ask your child to trace the letter with their finger. You can show them how to do it and they can copy you. This is great if the letters in the book have textures, are embossed or a are hidden within the picture. So there you have it, these are my tips to get the most out of your alphabet books. If you have different tips to the ones I included, feel free to share in the comments. This month I have been posting on Millie’s Facebook page something a little different. I have made a bilingual alphabet colouring pages printable for you. A few months ago we were given this beautiful alphabet book (in English) as a present for my little girl. She absolutely loves it, however, it was very hard for me to translate to Spanish on the spot because I didn’t know whether to follow the image or the letter. So I got this idea to make my own little animal alphabet, but I didn’t really pay attention to it as I was also working on finishing up Millie makes a new friend. For some reason, this idea kept coming into my head so I decided that I had to do something about it. For weeks I kept thinking of the animals with different letters of the alphabet that would be the same in English and Spanish and then finally I came up with a list! Here is where I gave myself a little challenge to post one letter everyday during February. Now that the month is over I just wanted to keep this somewhere as a printable version so you can come back to it any time you need it. I really hope you and your kid(s) enjoy it as much as I enjoyed making this. 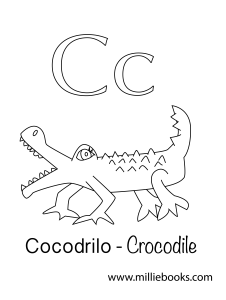 Download the printable Bilingual animal alphabet (Spanish-English) and get colouring!